Welcome to the website of the Newton Depot, home of the Southeastern Narrow Gauge & Shortline Museum. 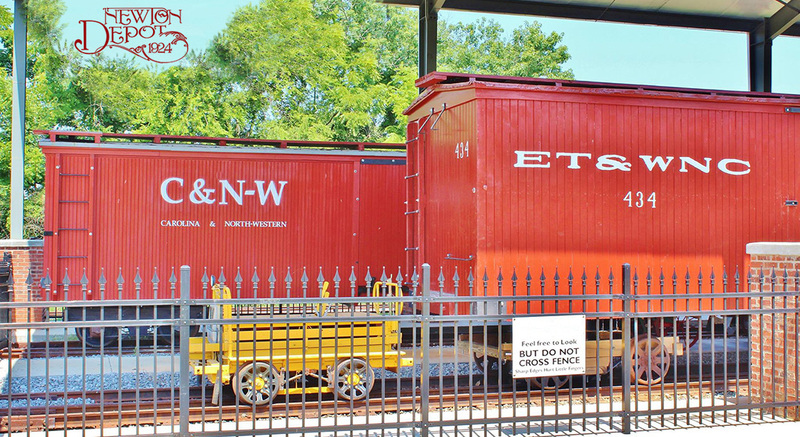 Our museum is jointly operated by the Newton (NC) Depot Authority and the Alexander Chapter of the National Railway Historical Society- western NC's oldest railroad preservation organization. The southeast's history is diverse, rich, and firmly rooted in business and personal identity. Known for the production of agriculture, textiles, timber, and furniture, our industrial legacy was built upon a backbone of steel rails and wooden ties. From the 1830's until the present day, small railroads and narrow gauge lines provided a critical arteries for passengers, freight, and materials required for commerce. Along these rails are also scattered memories- loved ones embarking upon a new adventure, the soldier hero returning from war, or perhaps a simple visit with favorite cousins. Our museum- the ONLY railroad museum in the south with a concentration of narrow gauge railroading- houses a collection of vintage railroad equipment that dates as far back as the era of Reconstruction, days when primitive iron rails endeavored to connect the cotton fields of lowland farms to the vast timber interests of the Appalachians. This collection includes boxcars, log cars, passenger cars, cabooses, and a steam locomotive. We have the largest collection of vintage narrow gauge equipment in the south. Additionally, we operate several model railroads of N, HO, and O scale in our dedicated model railroad center. At the center of our 4-acre campus is an authentic Southern Railway depot, built in 1924. The depot houses our indoor museum, offices, and rental facilities. Whether you are local or on a journey, make plans to visit us- we're family friendly with LOTS of hands-on activities and free admission, convienently located near I-40, I-77, I-85, Hwy 321, Hwy 16, and Hwy 70. Open: Friday & Saturday 9am-4pm. Tours may be arranged for other times.